Recently, some friends and I curated an event for our local Boulder community called Golden Hour. 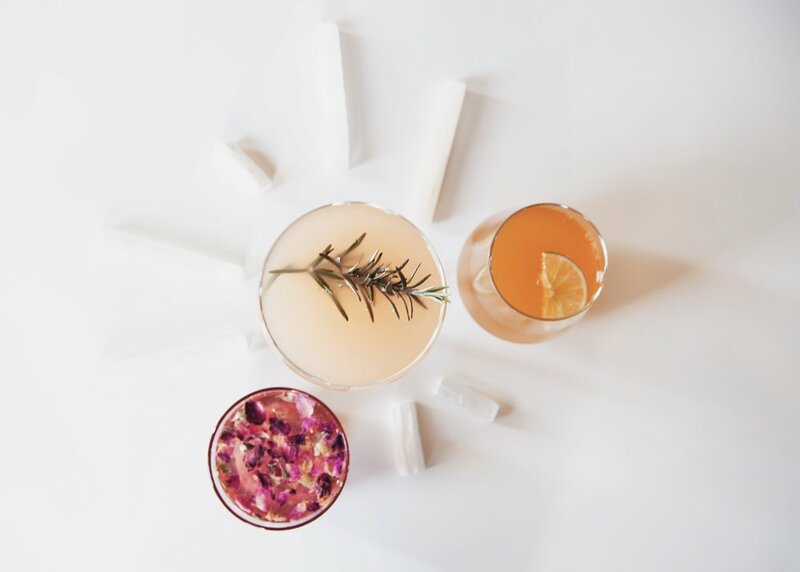 It was designed to be an elevated happy hour - with health supportive, adaptogenic mocktails, vibey music, organic/vegetarian hors d’oeuvres, low lighting, crystal center pieces to activate the space + intuitive readings. We wanted to create an alternative to the outdated bar scene that doesn’t seem to align with a lot of us. I know for me, I love going out on the weekends with friends, but it is rare that I find an environment that I actually love. Our event ended up being a a hit and we intend on offering more Golden Hour’s this summer (stay tuned)! I was in charge of designing the mocktail menu for the evening and I am excited to say I will be making these drinks all summer long for dinner parties. Everyone loved them and felt amazing after drinking them, so I thought you guys should have the recipes as well. :) Of course, besides tasting good, they all have their therapeutic benefits that make them an appropriate + health supportive drink for any night of the week. Combine all ingredients into a cocktail shaker or mason jar, except for the soda water, and shake with ice. Strain and transfer to a glass. Top off with soda water. In a glass, muddle raspberry, by erika elizabeth rose, rose water, rose syrup + lavender lemon balm bitters. Add ice, top off with soda water & stir. Combine all ingredients into a cocktail shaker or mason jar, except for the soda water, and shake with ice. Strain and transfer to a glass. Top off with soda water + garnish with fresh rosemary.